Murray Staaaaaattteee!!!! The Racers are one of my favorite mid-majors in the Dance this year, because a beloved high school teacher went there. (I think. WHAT UP, MRS. BALDRIDGE. I REALLY ENJOYED FIRST HOUR.) The thing is, I can never pick a winner, and my support in this tournament means they’re basically doomed, so sorry, Murray State. And Mrs. Baldridge. Q. 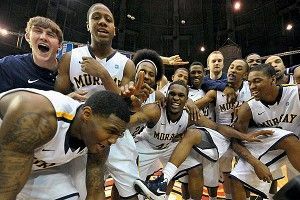 Where is Murray State? That’s actually just a guess, based on the fact that all good small basketball teams are from Kentucky. Hold on, let me look it up. Paducah, Murray, Kentucky. You probably know it from your political studies as about an hour away from Paducah, which is the seat of McCracken County. There’s also a uranium enrichment plant there, which is why all the Murray State basketball players are 9 feet tall. A. It’s a bit odd in this day and age, that’s for sure. But the Racers survived their out-of-conference schedule, which included decent programs such as Memphis, Southern Miss, Dayton, and Alabama-Birmingham. Now they just have to run the table in the Ohio Valley Conference, and 28-0 is within range. Catch (6) Murray State this afternoon. The Racers are scheduled to face (11) Colorado State at 12:15 p.m. EST on Thursday.